Opium. The very sound of the word conjures images of secret rooms in exotic lands, where languid smokers lounge dreamily in a blue haze of fragrant poppy smoke, inhaling vapors from long bamboo pipes tilted over the ruby flame of the jade lamp. Yet today very little accurate information is vailable regarding a custom that for 300 years was central to the lives of millions of people throughout the world. 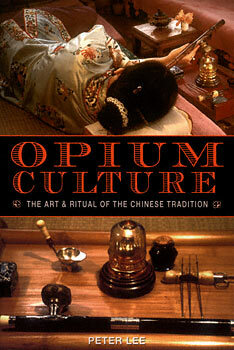 In Opium Culture Peter Lee presents a fascinating narrative that covers every aspect of the Chinese art and craft of smoking opium. Starting with a concise account of opium's long and colorful history and the story of how it came to be smoked for pleasure in China, Lee offers detailed descriptions of the growing and harvesting process; the exotic inventory of tools and paraphernalia required to smoke opium the Chinese way; its transition from a major healing herb to a forbidden substance suppressed by the modern pharmaceutical industry; its connections to the I Ching, Taoism, and Chinese medicine; and the art, culture, philosophy, pharmacology, and psychology of this traditional Asian custom. Highlighted throughout with interesting quotes from literary and artistic figures who were opium smokers, such as Jean Cocteau, Pablo Picasso, Emily Hahn, and Graham Greene, the text is studded with gems of long forgotten opium arcana and dispels many of the persistent myths about opium and its use as a relaxant. Peter Lee was born in Peking, China, in 1936. He studied at the University of California at Berkeley and the Sorbonne in Paris and has worked as a writer, translator, magazine editor, and professor. He now lives in retirement in Thailand.